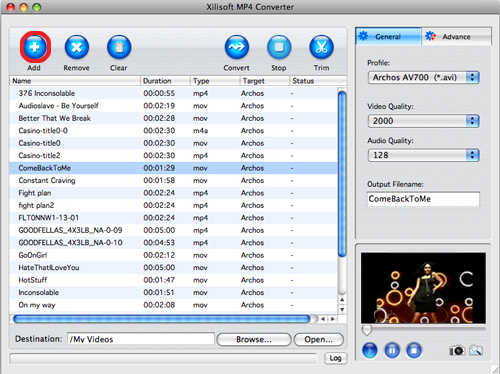 This step-by-step tutorial will show you how to convert various video files to MP4 video for playing on MP4 players. 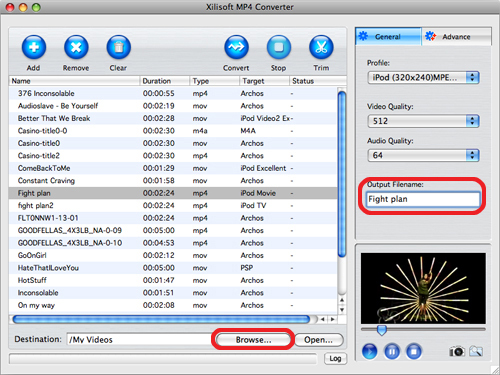 Download and install Xilisoft MP4 Converter for Mac on your Mac, then follow the steps below to accomplish the MP4 conversion. 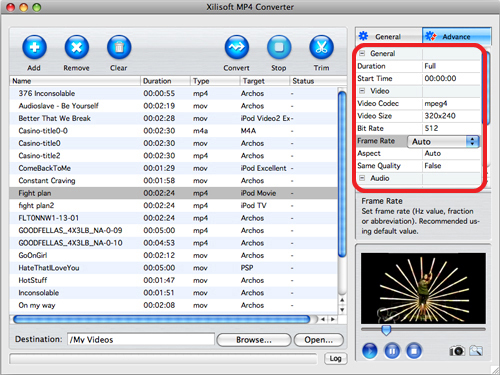 Before you start, run Xilisoft MP4 Converter for Mac at first. Click "Add" button on the toolbar or "File > Add" to load the files you want to convert. 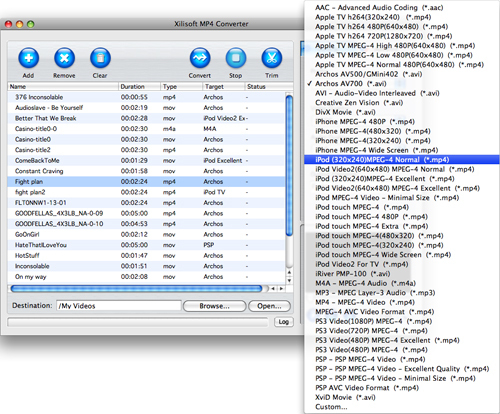 The loaded files are displayed in the file list. If you want to change the default target format, then choose the files to convert, and select the profile you want from the "Profile" drop-down list on the "General" tab. Click the "Browse" button to choose the folder to save the output files or just keep the default path, and enter the output file name you want in the "Output filename" textbox on the "General" tab. Tip: Before converting, you can preview the source file via the built-in player in the right bottom and also take a snapshot when previewing by clicking the "Capture Frame" button. If you're not satisfied with the default settings of the profile, you can adjust the parameter settings. Change video quality and audio quality on the "General" tab, or go to the "Advance" tab, and set the following parameters: video size, bit rate, frame rate, aspect, etc. Tip: If you just want to convert certain segment of a video, you can make it by entering the duration and start time on the "Advance" tab or following the steps below to get the segment you want. Choose the video you want to trim, and click the "Trim" button on the toolbar to enter the "Trim" window, then click the "Play" button to play the video. When it comes to the very start position, click the "Set Begin" button to set it as begin point, and then click the "Set End" button to set end point, then you will get the segment you want. If you're not happy with the segment you set, just click the "Reset" button to reset the segment. Click the "OK" button to apply your settings, and then a scissors icon will be added to the front of the file name. After everything is OK, click the "Convert" button on the toolbar to start converting. 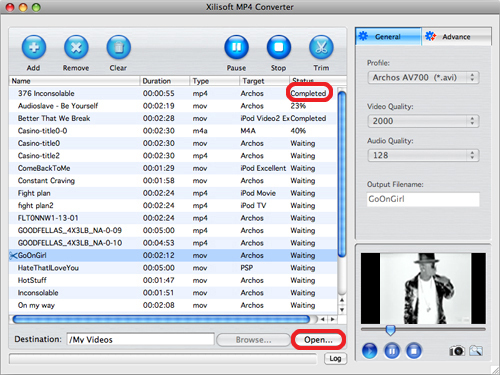 After the conversion completed, click the "Open" button next to the "Browse" button to open the destination folder for viewing the output files conveniently.